Vultures once soared high above the old town of Rocchetta a Volturno. Now the town is but a carcass of its former glory - yet life goes on all around. 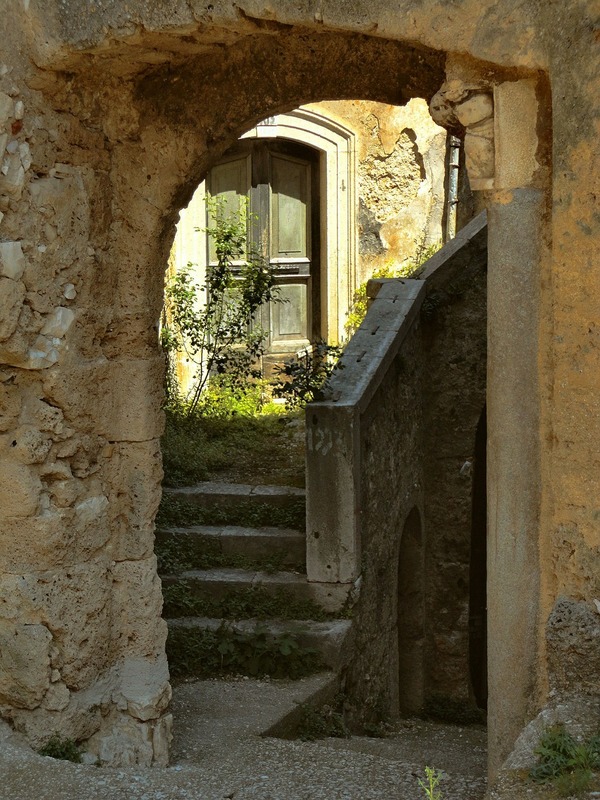 Italy is full of hidden treasures, towns you’d never find unless you knew they were there; villages you may not give a second thought to, because on the surface, well, they may be in ruin – may be just the skeletal frames of buildings ravaged by nature and by war. Rocchetta Alta is just so. But, look back in time and these ruins become a dramatic series of events that affected and shaped the surrounding area. Set on a mountain-side, the hamlet of Rocchetta Alta – now a ghost town – suffered one land slide then another, forcing the townsfolk to gradually migrate to the flatter, safer ground below. Now look to a possible future. Imagine yourself walking up to those ruins, following the road from Rocchetta a Volturno, nestled below. You may wonder, as I did, why settle halfway up a mountain in the first place? What was there to defend? That answer is discovered by turning around: from halfway up that hillside the plain that presents below is some of the richest, most exquisite farmland you’ll ever see… and it has been for centuries. It is the plain of Volturna. With respect to that fertile farmland, the townsfolk moving down from Rocchetta Alta settled on the edge of the plain. 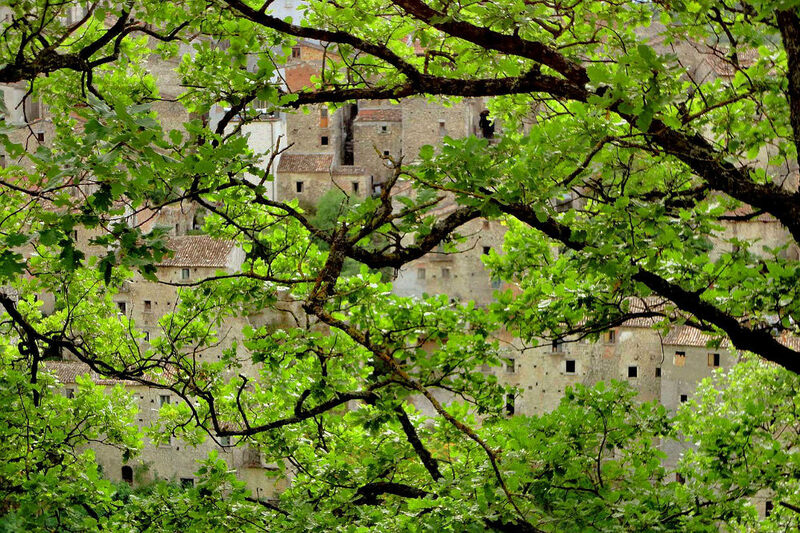 The result is the sprawling town of Rocchetta Nuovo, the houses of which are spread around the edge of a mountainside. In fact, the urban development of the entire region is patterned on the mountainous topography – all of which creates an overall effect so picturesque it must be seen to be believed. In Rocchetta Nuova, B&B Noce Spagnola is our choice. The building is indicative of the way the buildings in this area integrate with the (farming) environment. It is a beautifully renovated old stable, which I can assure you is now the epitome of human comfort. Pio, your host, will look after you in grand style; and once settled on the patio, gazing out at grazing cattle and groves of fig and olive trees, with the smell of fresh-baked bread wafting in, you’ll be hard pressed to move a muscle. But seriously, do not forget your walking shoes. The walks here are sublime, in a region where sparkling mountain lakes are the norm. Speaking of lakes, the Locanda Belvedere Da Stefano, nestled in the mountains nearby, offers up a mesmerizing view of the Lake di Castel San Vincenzo. The 15 minute walk to its shores is one I intend to do again and again. With so many hamlets and villages scattered around, it’s hard to pick and choose. My favorite outlying town is Barrea. Named for Lake Barrea, on which it is set, time spent here is both breathtaking and breath-enhancing. Think the opposite of fast food and you’ll get the idea. These farms and their restaurants are reason alone to visit this area. The other one, located in Rocchetta Nuevo is Agriturismo Taverna Verdicchio. The choice is yours. You have 2 simple options in and around Rocchetta a Volturno. Walk or drive around. Both are great options. Personally, I can wander these wooded lanes for weeks on end; but who wouldn’t love the drives? Close to Rocchetta a Volturno is the war museum, harking back to the fate of Rocchetta Alta, and this region’s involvement in WW2. Battiloro Castle provides similar interest. Oh, and not forgetting, this region is a paradise: for mountain-bikers in the summer, and for skiers in winter. In medieval times, the study of agricultural techniques was pursued by monks, who saw to the establishment of the many churches that grace this area. The Romanesque Church of Santa Maria delle Grotte and the Abbey of San Vincenzo al Voturno, both dating back to the 8th Century, are worth a look-see. As for festivals, the big one in this area, held in February, is the Carnival of Castelnuovo to Volturno: involving 2 people dressing up as deer, getting “shot” and being brought back to life Another event better seen than read. Without a car, you’re pretty well stuck in one spot. But as I said, that’s not a bad thing. Rocchetta a Volturno is accessed via Rome and Naples, from where you can catch a train to Isernia, via Campobasso, and from there, a taxi. Alternatively, taking the motorway from any of these cities opens up the entire area. First prize.